Size: Up to 6 feet tall, 2 or 3 feet wide. Growth Form: Shrub; scraggly, almost trunk-less, open crown and openly branched, sprawling, joints 4 to 12 inches long; stem segments usually alternate; older stems woody; terminal segments with prominent tubercles. Leaves: Leaves modified into spines or glochids and emerging from areoles spines 1 to 4 per areole, spines grayish or pink. Flower Color: Pink, magenta or lavender; inner tepals greenish basally to reddish bronze, tinged magenta; fruits persistent, spine-less, elongated with tubercles, green becoming red, fleshy. Flowering Season: May and June (late spring, early summer). Elevation: 2,500 to 5,500 feet. Habitat Preferences: Creosote bush and mesquite flats, limestone rocky slopes; Chihuahuan Desert species. Recorded Range: In the United States Klein's Pencil Cactus is found in NM, TX (possibly in OK). 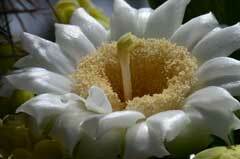 It is also native to northeast Mexico. North America & US County Distribution Map for Cylindropuntia kleiniae. U.S. Weed Information: No information available. Invasive/Noxious Weed Information: No information available. Wetland Indicator: No information available. Threatened/Endangered Information: No information available. 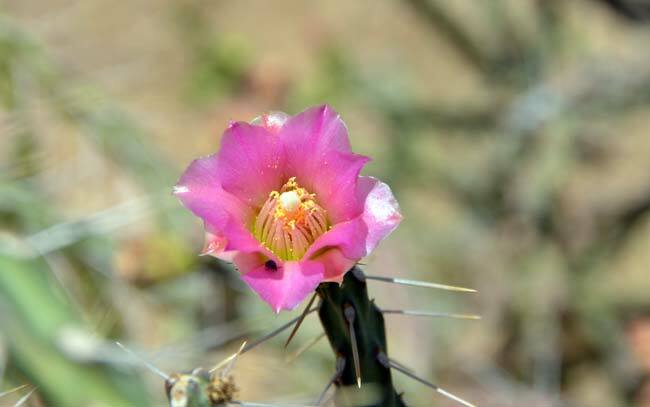 Genus Information: In North America there are 29 species and 39 accepted taxa overall for Cylindropuntia. Worldwide, The Plant List includes 43 accepted species names and a further 100 scientific names of infraspecific rank for the genus. In the Southwestern United States: Arizona has 12 species of genus, California has 10 species, Nevada has 5 species, New Mexico has 8 species, Texas has 6 species, Utah has 3 species. Hybrids excluded, all data is approximate and subject to taxonomic changes. 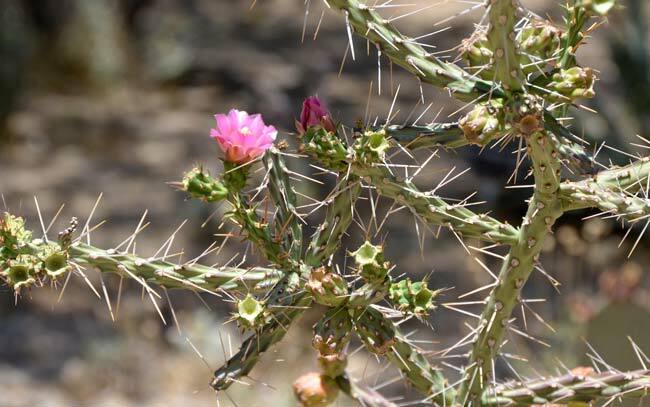 Comments: Klein's Pencil Cactus is mostly found within Chihuahuan desert habitats. This species is thought to have poorly defined taxonomic characteristics with more than 1 species or variety existing in the Trans-Pecos area. Some botanists think more taxonomic work is needed. 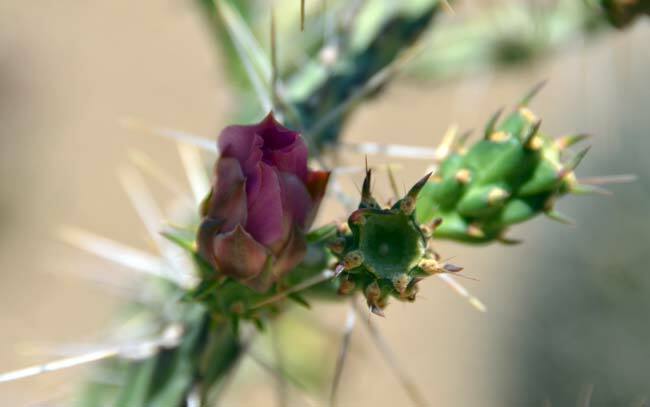 Klein's Pencil Cactus, Cylindropuntia kleiniae is in a group of cacti sometimes referred to as "pencil chollas"; it is similar to and closely related to Arizona Pencil Cholla, Cylindropuntia arbuscula and to Christmas Cholla, Cylindropuntia leptocaulis. In Southwest Desert Flora also see: Buckhorn Cholla, Cylindropuntia acanthocarpa, Arizona Pencil Cholla, Cylindropuntia arbuscula, Teddy Bear Cholla, Cylindropuntia bigelovii, Jumping Cholla, Cylindropuntia fulgida, Gander's Buckhorn Cholla, Cylindropuntia ganderi, Christmas Cactus, Cylindropuntia leptocaulis, Walkingstick Cactus, Cylindropuntia spinosior and Baja Pencil Cholla, Cylindropuntia tesajo. U.S. Dept. of Agriculture, Natural Resources Conservation Service on-line database and USGS ITIS search (accessed 07/24/2017). The Plant List (2013). Version 1.1. Published on the Internet; http://www.theplantlist.org/ (accessed 07/24/2017). Donald J. Pinkava, FNA | Family List | FNA Vol. 4 | Cactaceae| Page 104, 106, 107 | Cylindropuntia | Flora of North America Editorial Committee, eds. 1993+. Flora of North America North of Mexico. 16+ vols. New York and Oxford. (accessed 07-Jun-2015). 1969, Benson, Lyman, The Cacti of Arizona, The University of Arizona Press, Tucson, Arizona.